In the period before Christmas my fishmonger at the Queen Victoria Market seemed to be stocking a large quantity of what I call festive fish – mainly lobsters (called crayfish incorrectly), bugs, prawns, scallops and sashimi grade tuna – not the type of fish that I am interested in purchasing. He always seems to have sardines, and squid but there seem to be no room in his display cabinet or fridge for these. He had run out of the small supply of King George whiting and flathead so I walked away with Snapper. I felt uncomfortable with this choice because I knew that although the Department of Primary Industries in Victoria (Fisheries) lists snapper as a sustainable species, in Australia’s Sustainable Seafood Guide (AMCS) it is considered to be overfished and environmentally limited in VIC.And that is just the issue; it can be relatively difficult to find information about making ethical choices and to purchase sustainable seafood. This being the first week in January I was even more disappointed to find large supplies of swordfish, marlin and shark (marketed as flake, particularly in Victoria). He also had blue grenadier, blue warehou, snapper again, all classified as not sustainable by AMCS. However he did have trevally a relative cheaper and tasty fish that is also sustainable. 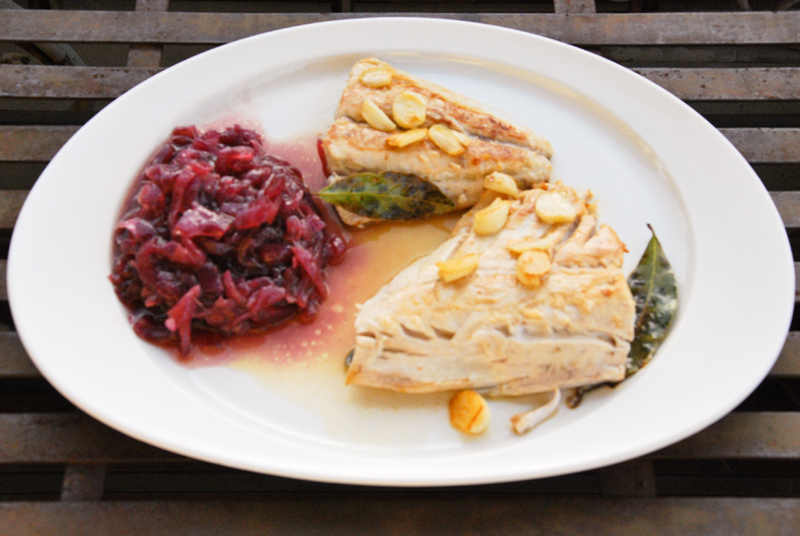 It is a strong tasting fish and a very suitable choice for making Pisci All’ Agghiata – soused fish with complimentary strong flavours – vinegar, garlic and bay. Aglio is the Italian word for garlic (agghiu in Sicilian), so it is easy to guess what ingredient is the defined flavour. I had some Cippolata (a thick sauce made with onions, sugar and vinegar) in my fridge that I had previously made for another dish and presenting this as an accompaniment seemed perfect. Coat the fish lightly in flour with little salt (optional and traditional). Fry the fish in hot extra virgin olive oil, until all the sides are golden. Remove the fish and set aside. Use the same oil or replace it (if you have coated the fish with flour). Heat the oil. Add the garlic and when it becomes golden add the vinegar and evaporate for a few minutes. Place the fish in a bowl deep enough to hold the fish and vinegar marinade. Intersperse the fish with fresh bay leaves. Pour the marinade over the fish. Cool it, cover and let the fish rest for several hours before serving at room temperature (or store in the fridge until ready to serve, and remove it from the fridge about an hour beforehand). 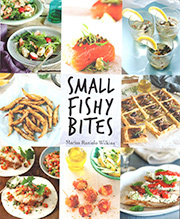 Australia’s Sustainable Seafood Guide Online – the first online sustainability guide in Australia. Developed in response to growing public concerns about the state of our seas, it is designed to help you make informed seafood choices and play a part in swelling the tide for sustainable seafood. 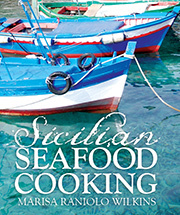 Visit www.sustainableseafood.org.au to learn more about sustainable seafood and buy your copy of the guide today.